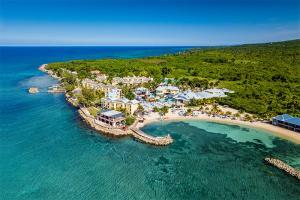 Discover Jewel Resorts’ most-inclusive adults-only oceanfront resort in Runaway Bay on Jamaica’s famed North Coast. Boasting 225 chic rooms to butler-serviced junior suites, round-trip Montego Bay airport transfers, popular island tours and excursions, three pools including swim-up bar and in-pool concierge, complimentary resort-wide WiFi, superb dining options, premium liquors, nightclub, complimentary greens fee, transfers and coaching included at nearby Runaway Bay Golf Club, non-motorized water sports, fitness center and tennis with instruction, optional full service spa, salon, photo shop and more. Ideal for friends, couples, weddings, honeymoons and groups. Approximately 80 minutes/42 miles from Sangster International Airport (MBJ) in Montego Bay and 16 miles from Ocho Rios.